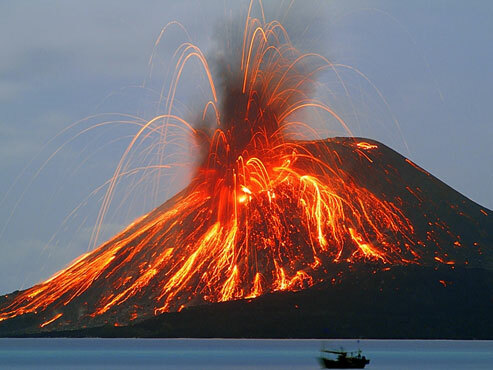 I've been rereading the book Krakatoa, The Day the World Exploded: August 27, 1883. Yesterday, as I was reading the chapter on the final and a cataclysmic explosion that blew the entire island into oblivion, I finally noticed I was reading it exactly 127 years to the day of the events. Krakatoa had been erupting in spurts since April of 1883, but around 1pm on August 26th it began it's death throes. In fact, I noticed this at about 8pm Pacific Time last night on the 26th, which was about 10am on the 27th local time in Indonesia: nearly the exact time that Krakatoa exploded (10:02 am, August 27th, 1883). Spooky, huh? At the time, the summit of Krakatoa was about 2,600 feet above sea level. When it exploded, it unleashed the loudest non-electronically amplified sound in the history of man (that we know of). It was clearly heard and recorded 3,000 miles away on the island of Rodriguez. Imagine something exploding in San Francisco and being able to hear it in Philadelphia. (One person claimed to have heard it twelve thousand miles away, but most people dismiss his account as a fabrication.) The pressure waves circled the globe seven times. While it wasn't the most deadly volcanic eruption, the ensuing tsunamis killed in the neighborhood of 30,000 people. With the advent of the telegraph, it was one of the first global news events reported on almost immediately in newspapers around the world. The picture at the top of this post is Krakatoa today, or rather when it erupted in 2007. After vanishing beneath the sea, it's risen to height of nearly 1,000 feet in the last 127 years. Below is a map showing the parts of the island that were destroyed. You'll notice the two islands at the outer perimeter that were not a part of Krakatoa when it exploded in 1883, but were clearly a part of a much larger Krakatoa at one time. The book Catastrophe by David Keys alleges that the eruption and destruction of that Krakatoa around the year 535 brought about a variety of global changes such as the fall of the Roman and Mesoamerican empires and the unification of China.